"Owlwatch developed a sophisticated website for me that is so easy to maintain and update that I can do it all myself, which is so very empowering and satisfying. Now I can edit my website content; submit articles, photography and video whenever I want and I can do it all with ease. I had to idea that I would be able to do this, and I thank Owl Watch for supplying me with the knowledge and the tools to do so!" I have been with owl watch consulting since 2005 and they have always provided me with top quality service and care in a timely manner. Because of them I have a quality way to display my artwork to a larger audience. Thanks Owl Watch. 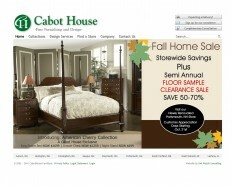 We recently gave Cabot House Furniture a whole new look. We moved the site to a new CMS and integrated all the old functionality into one cohesive site. In addition to window shopping, the site allows customers to opt-in/opt-out of their promotional Newsletters and to interrogate delivery time frame for purchases.